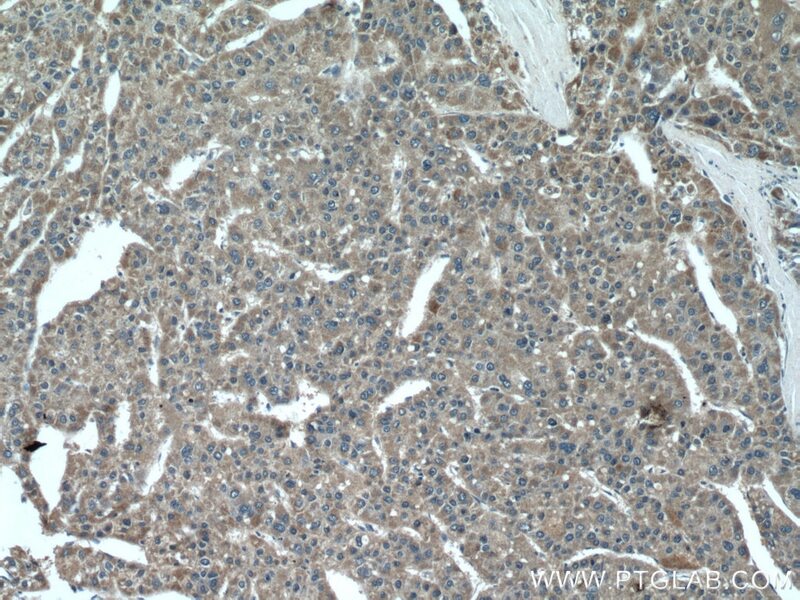 Immunohistochemical analysis of paraffin-embedded human liver cancer tissue slide using 17356-1-AP (CHDH antibody) at dilution of 1:200 (under 10x lens). 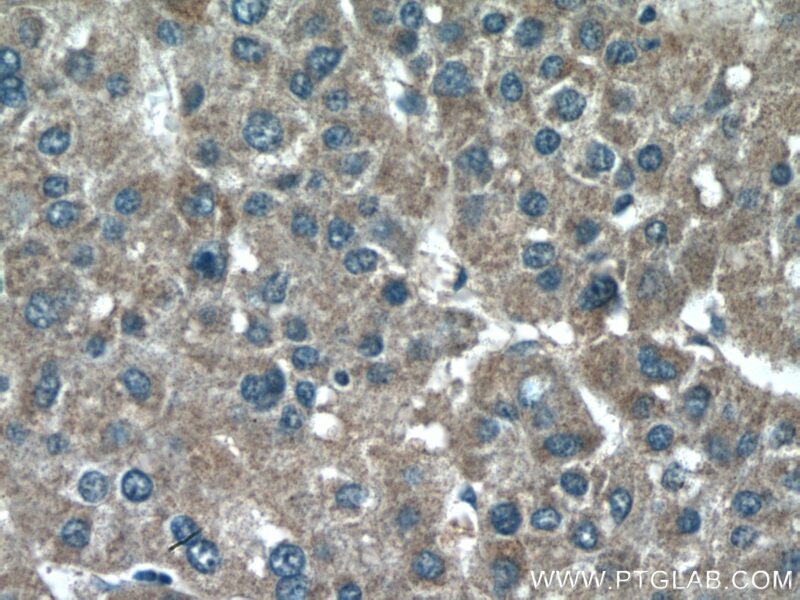 Immunohistochemical analysis of paraffin-embedded human liver cancer tissue slide using 17356-1-AP (CHDH antibody) at dilution of 1:200 (under 40x lens). CHDH(Choline dehydrogenase, mitochondrial) is also named as CDH,CHD and belongs to the GMC oxidoreductase family. CHDH is a member of the glucose-methanol-choline family of oxidoreductases, with each member containing a consensus FAD-binding domain. Many members of this oxidoreductase family are soluble proteins but mammalian CHDH is associated with the inner mitochondrial membrane(Handbook of vitamins,Robert B,2007). The full length protein(65 kDa) has a transit peptide of 29 amino acid and the mature CHDH is appropriately located in the inner mitochondria membrane(PMID:12951056). 17356-1-AP can also recognize the 45 kDa isoform X3 of CHDH. 40 ug of mouse liver lysate was loaded onto the gel. The incubation time is over night at 4oC. Betaine is accumulated via transient choline dehydrogenase activation during Mouse oocyte meiotic maturation. 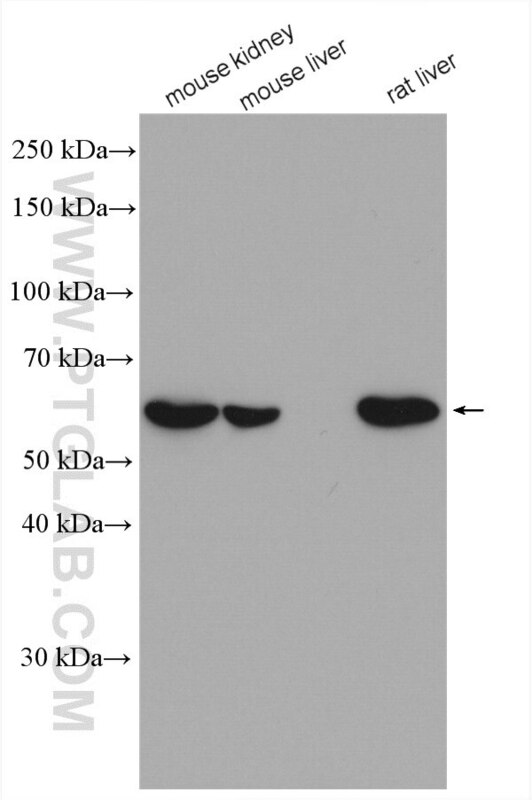 Choline dehydrogenase polymorphism rs12676 is a functional variation and is associated with changes in human sperm cell function.